Adapt-N is an on-line tool that provides location-specific, weather-adjusted nitrogen (N) recommendations for corn. At sidedress time, critical early-season weather that strongly influences actual N needs is incorporated into the recommendation. To accomplish this, the tool uses 1) a simulation model that was developed and calibrated through field research over several decades, 2) high resolution 2.5 x 2.5 mile daily temperature and precipitation information, and 3) soil and crop management information entered via a web interface on any internet-capable device. Adapt-N’s cloud-based environment (central data server, high security, and accessibility through desktop, laptop and mobile devices, future embedding in other farm software) offers a user-friendly experience. We conducted a total of 104 strip trials in 2011, 2012, and 2013 in New York and Iowa (Figure 1) to beta test Adapt-N for its ability to improve recommendations for corn N need at sidedress time. Yield data and simulated losses across trials show that the Adapt-N tool significantly increased grower profits, while decreasing N inputs and environmental losses, as summarized in this article. In 2014, Adapt-N was commercialized through a public-private partnership between Cornell University and Agronomic Technology Corporation (ATC, see http://www.adapt-n.com/). The partnership aims to sustain and broaden the tool’s availability, customer service, usability, and integration with existing farm management technologies, while allowing for continued research and development at Cornell University. We completed 67 replicated strip trials in New York (14 in 2011; 42 in 2012; 11 in 2013) and 37 trials in Iowa (9 in 2011; 19 in 2012; 9 in 2013) on commercial and research farms throughout each state (Figure 1. One 2012 trial in Minnesota is included with the Iowa trials). Sidedress treatments involved at least two rates of nitrogen, a conventional “Grower-N” rate based on current grower practice (G) and an “Adapt-N” recommended rate (A). An Adapt-N simulation was run for each field just prior to sidedressing to determine the optimum weather-adjusted N rate. Table 1. Agronomic, economic and environmental assessment of model performance in 2012. Values are average differences resulting from Adapt-N use (Adapt-N minus Grower-N treatment) such that a negative number shows a decrease due to Adapt-N, a positive number shows an increase due to Adapt-N. *Simulated N leaching losses and N total losses do not include 2011 IA trials – data not available. Yields were measured by weigh wagon, yield monitor, or in a few cases by representative sampling (two 20 ft x 2 row sections per strip). Partial profit differences between the Adapt-N and Grower-N practices were estimated using prices of $0.50/lb N, $5/bu grain, $50/T silage, and $8/ac operational savings if sidedress was avoided in either the Adapt-N or Grower treatment. Yields were used as measured, regardless of statistical significance, since the statistical power to detect treatment effects for a single experiment is inherently low. Total N losses to the environment (atmosphere and water) and N leaching losses were simulated by Adapt-N for each N treatment, through the end of each growing season. End dates for N loss simulation were October 30, 2011 (NY trials only), December 15, 2012, and December 31, 2013. More detailed descriptions of each year’s methods and results were provided in previous WCU articles (Moebius-Clune et al., 2012, 2013, and 2014). Adapt-N rates resulted in average N input reductions of 52 lbs/ac in NY, 29 lbs/ac in IA, and 44 lbs/ac overall (Table 1). Profit gains from the use of Adapt-N were considerable. 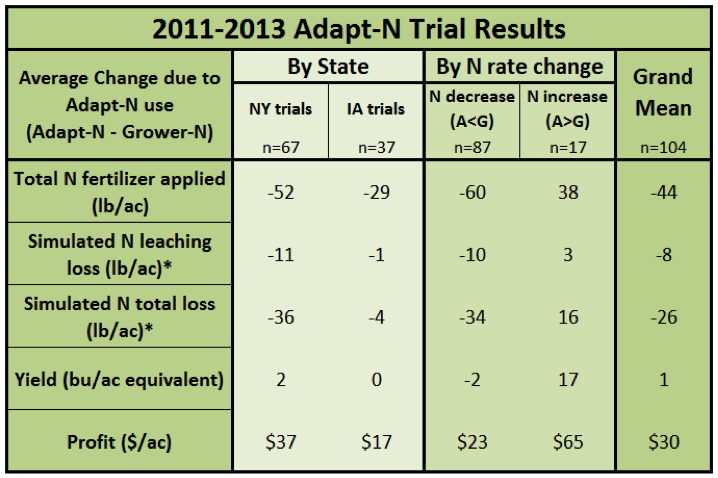 Profits increased in 81% of all NY trials, in 70% of all IA trials, and in 77% overall when growers followed Adapt-N recommendations (Figure 2). Profit gains of $30/ac on average ($37/ac in NY, $17/ac in IA) were obtained most frequently due to reductions in N inputs, without significant yield loss: +1 bu/ac on average across all trials. Most collaborating growers were already using progressive N management including sidedressing, so that benefits achieved in these trials can be considered to be a conservative estimate of potential benefits of using Adapt-N. Benefits will be higher for growers who currently use few N best management practices. Figure 2. Proportion of trials with profit gains (dark green) or losses (light green) as a result of using the Adapt-N recommendation compared to current grower N management in 2011-2013 trials. With appropriate use of the most up-to-date version of Adapt-N, success rates can be further improved. Decreased N rates: Adapt-N recommended a lower N rate than grower practice in 84% of trials, by 60 lbs/ac on average (Table 1). Such recommendations occurred after a normal or dry spring, when N from spring mineralization or early fertilizer applications remains available to the crop. Yield losses were generally minor, averaging -2 bu/ac across trials with N reductions, and leading to profit gains in 79% of cases – on average $23/ac (Table 1, Figures 2 and 3). This implies that a grower is about four times more likely to achieve increased profit from a reduced Adapt-N rate than from their current higher rate. This statistic includes all trials over three years, although model improvements have been made each year based on trial information, such that actual probabilities of increased profit with reduced N inputs are likely further improved for future years. Increased N rates: Even larger profit gains of $65/ac on average were achieved when Adapt-N recommended increasing N inputs over the grower’s current practice in 16% of trials. Consequent average yield increases of 17 bu/ac across these trials were achieved for an average additional 38lb/ac fertilizer application (Table 1). Such higher recommendations occurred primarily in 2013 ($94/ac profit on average in NY 2013 trials), and in select locations in other years, after a wet spring. Needs for additional N were correctly identified in 65% of these cases, resulting in significant yield and profit increases. In 35% of cases, on the other hand, the additional N was not needed. In almost all of these cases, unpredictable post-sidedress drought decreased yield potential below the expected yield that was used for the recommendation at the time the sidedress rate decision had to be made (Moebius-Clune et al., 2013). Profit loss when under-fertilizing (from reduced yields) is generally larger than when over-fertilizing (from unnecessary fertilizer application). Thus lower recommendations to account for potential future yield-limiting events cannot be justified for economical sidedress recommendations. By contrast, pre-sidedress weather events affecting yield potential and N availability are known, and Adapt-N can effectively manage this risk. Therefore, the chances of over-recommending N inputs are somewhat higher than those of under-recommending, further decreasing risk of profit loss. For illustration, overall, profit gains greater than $50/ac occurred in 29 cases, while losses greater than $50/ac were determined in only 2 cases (Figure 3). Figure 3. Results from each trial (n = 104) are vertically aligned. Bars show difference between Adapt-N and Grower treatments (A-G) such that negative numbers (orange) show decrease due to Adapt-N, and positive numbers (green) show increase due to Adapt-N.
Adapt-N reduced N rates in 84% of cases, by 60 lbs N/ac on average, resulting in simulated reductions in total N losses to the environment by the end of the growing season of 34 lbs/ac, and leaching losses by 10 lbs N/ac (Table 1). Further losses of residual excess N generally occur over the winter and spring months when crop uptake ceases, soil water is recharged, and saturation or near-saturation occur, particularly in the Northeast. Thus the simulated reductions are a low estimate of actual environmental loss reductions, which are likely closer to the difference in applied N. In 16% of trials, where Adapt-N increased N rates, by 38 lbs/ac on average, total N losses increased on average by only 16 lbs/ac, and leaching losses by 3 lbs/ac. Further over-winter losses in these cases are lower, because much of the additional applied N was taken up by the crop to produce the increased yield, and thus would not be lost. Plan to apply the majority of fertilizer nitrogen at sidedress time instead of prior to or at planting. If manure is applied prior to planting or when enhanced efficiency products are used, aim for conservative rates. Monitor the field’s N status and account for early season weather impacts on N availability by using Adapt-N’s daily updates. Supply input information on soil and crop management that is representative of each management unit (e.g. test soil and manure based on representative samples, keep good records of operations, estimate expected yield as the second-highest out of 5 years of accurate yield information). For each management unit, measure soil organic matter at least every 3 years, ideally to a 12” depth. If appropriate, adapt input information at the time of sidedressing to account for seasonal influences, such as decreased yield potentials or shallow rooting depths from extreme wet conditions. Use the most recent Adapt-N recommendation available on sidedress day. Apply sidedress N between V6 and V12, depending on N and equipment availability. Generally, later sidedressing with high-clearance applicators allows for more accurate recommendations. Variable rate applicators can be used to adjust Adapt-N simulations for management units in fields. Use Adapt-N scenario simulations after the growing season to learn more about how weather and management influence N availability. In the long term, manage for healthy soils and use Adapt-N to account for N contributions from high organic matter levels and deep root zones. Three consecutive growing seasons involving 104 on-farm strip trials demonstrate that Adapt-N is an effective tool for N management in corn systems, with average profit gains of at least $30/ac. With model improvements and increased expert use of the tool, we estimate that profit gains over current grower practices can be expected in at least four out of five cases. Adapt-N generally correctly identified cases when either decreased or increased N was needed to maintain yields. The tool also provides a strong incentive to shift N applications to sidedress time when weather impacts can be accounted for in the model. By using Adapt-N, growers can contribute to solving persistent problems with greenhouse gas emissions, groundwater pollution, and hypoxia in our estuaries, while increasing profits in both wet and dry years. For more information: Recorded webinars, a manual, and other Adapt-N training materials are available at http://adapt-n.cals.cornell.edu/. The Adapt-N tool is accessible through any device with internet access, now from the team’s commercial partner, Agronomic Technology Corporation, at http://www.adapt-n.com/ (cost is about $1-3/ac, depending on area covered). Adapt-N users can elect to receive email and/or cell phone alerts providing daily updates on N recommendations and soil N and water status for each management unit in Adapt-N.
Acknowledgements: This work was supported by funding from the NY Farm Viability Institute, the USDA-NRCS Conservation Innovation Program, the International Plant Nutrition Institute, McKnight Foundation, Walton Family Foundation, USDA-NIFA, MGT Envirotec, and USDA-SARE. We are grateful for the cooperation in field activities from Keith Severson, Kevin Ganoe, Sandra Menasha, Joe Lawrence, Anita Deming, Harry Fefee, Kitty O’Neil, Mike Hunter, and Brent Buchanan of Cornell Cooperative Extension, Bob Schindelbeck of the Cornell Section of Soil and Crop Sciences, Mike Davis at the Willsboro Research Farm, Dave DeGolyer, Dave Shearing and Jason Post at Western NY Crop Management Association, Eric Bever and Mike Contessa at Champlain Valley Agronomics, Eric Young at Miner Institute, and Peg Cook at Cook’s Consulting in New York, and from Shannon Gomes, Hal Tucker, Michael McNeil, and Frank Moore at MGT Envirotec. We also are thankful for the cooperation of the many farmers who implemented these trials on their farms. Moebius-Clune, B.N., M. Ball, H. van Es, J. Melkonian. 2014. 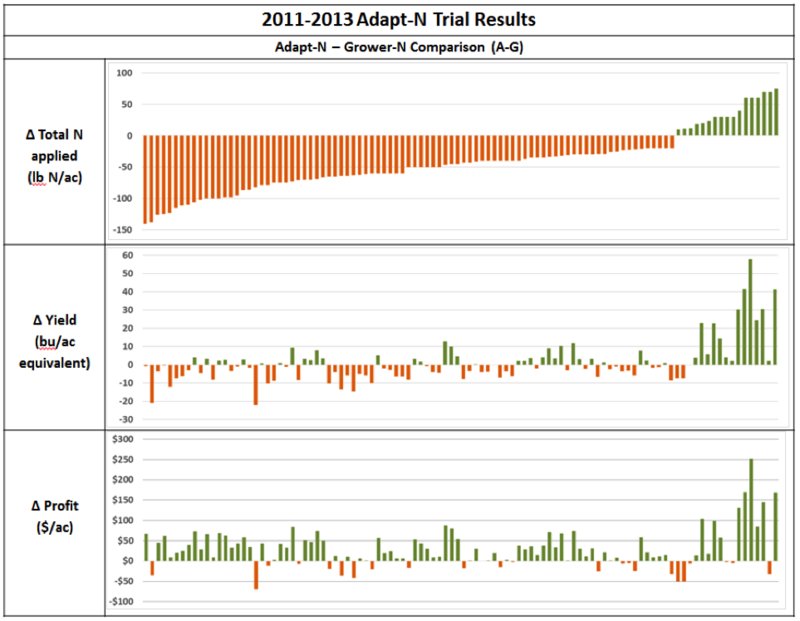 Adapt-N Responds to Weather, Increases Grower Profits in 2013 Strip Trials. What’s Cropping Up? 24:3. Moebius-Clune, B., M. Carlson, H. van Es, and J. Melkonian. 2013. Adapt-N Increased Grower Profits and Decreased Nitrogen Inputs in 2012 Strip Trials. What’s Cropping Up? Moebius-Clune, B., H. van Es, and J. Melkonian. 2012. Adapt-N Increased Grower Profits and Decreased Environmental N Losses in 2011 Strip Trials. What’s Cropping Up? 22.